Months ago I read "Patchwork Nation," one of those books that takes a long swipe at American Politics and creates an alternative to the Red vs. Blue model. I think it did a pretty good job, until I flipped forward to where it put Thurston County. Instead of putting my home county in Campus and Careers (state capitol, four year college, Arts Walk, Procession, come on!) the authors put us in Military Bastions. Fort Lewis is nextdoor and militarily folks do live around here, but it just didn't resonate with me. But, now that I take a closer look at the map of our new congressional district, I think they might have hit something I didn't see until now. Earlier I said that the new 10th CD will center on the Pierce County suburbs. But, now I think it'll center on Joint Base Fort Lewis McCord. While the early scuttlebut is that the district is centered on Olympia, the nature of the district will be that of a military base town. Let's take a closer look. Here's a map where I split the district into two parts. Basically, the gray area is the Olympia influenced side (hippies, state government). 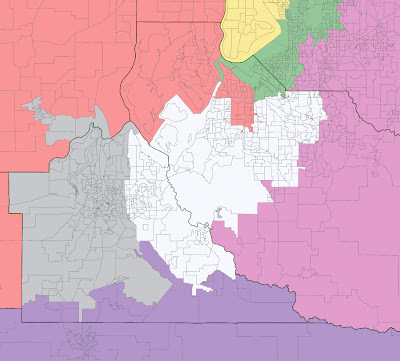 The white side is the Fort Lewis influenced side. I did allow for a lot of cross over into Thurston County, but I'm pretty sure that's accurate. The Olympia influenced side is 59.4 Democratic (from the 2010 Senate race) and is pretty small, only 148,000 of the more than 600,000 in the district. The JBLM side is much much larger (521k) and only barely Democratic at 50.3 percent. Here's a map of the district by how it voted in the last Senate election. The deeper the blue, more Democratic, the more red, Republican. You can clearly see the heart of Olympia in the middle left is pretty blue. But, as you go out toward Lacey (especially the new Hawks Prairie neighborhoods) and into the suburbs around Lakewood and Parkland, the district gets pretty red. The district as a whole still leans Democratic, but it'll be interesting to see the politics that can shaped by the politics of a base community. What are the issues that specifically impact these sorts of towns?